Main compartment: 18" x 11" x 6"
Its large main compartment has a pocket that will fit most sleeved laptops and the bungeed cinch top will keep any load in place. Sized for use as a Go-Bag, day trips, office commutes, or as a smaller carry-on, our RUSH 12 pack is loaded with most of the same features as its larger teammates for maximum utility. Designed by special operations combat veteran, Kyle Lamb of VTACTM, the RUSH 12 was created because of end-user input. Its large main compartment has a pocket that will fit most sleeved laptops and the bungeed cinch top will keep any load in place. Two mesh pockets on the inside of the main flap hold computer accessories, electronics, binos, and other smaller items you want readily accessible. The 12"H x 9"W x 1"D Admin compartment on the front of the pack opens wide and has slots and pockets to organize pens, business cards, camera, GPS, and much more, plus two key keepers and a large internal zippered pocket. Web platform on the outside of the compartment allows you to add 5.11s SlickStickTM pouches for even more gear capacity and the 2" x 3" velcro patch is great for flag or unit patches. The 5"H x 8"W zippered pocket above the Admin compartment is a handy spot for radio, phone, travel documents, energy bars, and smaller gear and is also covered with web platform and a velcro patch for your nametape. Two compression straps keep everything snugged closer to your body for comfortable load management. We also tucked our zippered fleece-lined eyewear pocket on top, just behind the heavy-duty grab handle. Dual concealed hydration tube ports are located to the sides of the handle. Both sides feature top-to-bottom web platform, allowing you to attach a host of different 5.11s SlickStickTM accessories. The back panel conceals a reinforced hydration pocket that will accommodate bladders up to 60 oz. The extra padding on the back panel promotes ventilation and the anti-skid pads help keep the RUSH 12 in place. We added tri-glide fasteners at the bottom corners in case you want to add a waist belt. The padded contoured shoulder straps have four rows of web platform and the sternum strap can be adjusted to four heights. Excess webbing can be gathered at the bottom of the straps with our elastic keepers. Two 3/8" grommets in the bottom panel let the RUSH 12 breathe and allow water and debris to escape. We also added four attachment points for 1" webbing to the bottom. Constructed of water-resistant 1050-denier nylon, the RUSH 12 Backpack will go the distance! We use self-repairing YKK® nylon coil zippers throughout and our high-impact plastic side release buckles, tri-glide fasteners, and other hardware are not affected by differences in climate. Metal grommets and zipper sliders are coated to match the pack and for resistance to corrosion. 5.11 Tactical has joined forces with Special Operations Combat Veteran SGM (RET) Kyle E. Lamb. He served his country for 21 years, 17 of which were with the most elite elements of the U.S. Army Special Operations Command. He was decorated for valor for his actions in Mogadishu, Somalia, during the battle that was made famous by the movie Blackhawk Down, and during Operation Iraqi Freedom. SGM Lambs master-level expertise comes directly from real-world experience, making him one of the most credible and sought-after shooting and tactics instructors in the United States. He also owns Viking Tactic, Inc. (VTACTM), and is the inventor of the Viking Tactics Sling. 5.11 Tactical SlickstickTM pouches are compatible with standard molle attachment systems. The SlickstickTM slides through a UV-resistant ring making attachment of your 5.11 Tactical pouches quicker and easier than other molle-compatible accessories. To remove an item, just pop the snap and pull the Slickstick out. The features, materials, and design of the RUSH 12 Backpack make it a superior value. 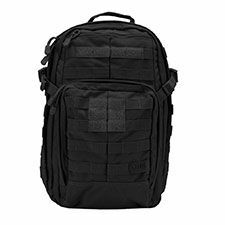 5.11 Tactical packs are in use by Law Enforcement, First Responder, and Military units and other demanding professionals around the world.